Our moon is something special. It illuminates the magical things that could otherwise hide from view. 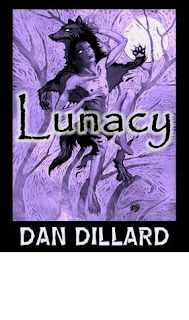 Lunacy is the first book by Dan Dillard that speaks to a YA audience. Our nightmares are born while we are young, and they don’t go away just because we grow up. Includes Something Wiccan This Way Comes, Legendary, and the poem, Jeremy Boone among others. Lunacy is a unique collection of short stories and poems. Although I don't like poems I actually found the ones in this collection to be quite enjoyable. They were all pretty short, so the length was perfect, and I loved that they all rhymed. I know poems don't have to rhyme, but there is just something about a poem that does rhyme, that does it for me. Especially when they are creepy rhyming poems. I thought the creep factor was just right in the poems and really kept the theme of creepiness. I don't think I would have liked this collection as much as I did without the poems. They really were the glue that held everything together. The only thing I didn't like about the poems was that it was a little hard to go from rhyming back to normal story telling. It tripped me up every time I would go to start the next short story. Lunacy is the first short story. It is basically a legend on werewolves. It follows a guy named Jason who is trying to figure out how he became this monster, while on his own. As he moves to a different city he finds others like him. 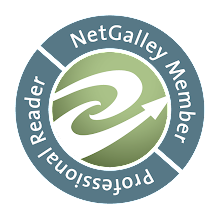 With the help of his new companions he find out what they really are, how it happened, and how to end it. At first I really enjoyed Lunacy, but by the end I was very confused. The ending just didn't make sense. It was pretty disappointing, because I wasn't fully invested in the story. It was interesting, but nothing grabbed me, so I was hoping the ending would bring everything together. Unfortunately, that was not the outcome. Legendary about a paleontologist who finds proof of mythical creatures. As he starts taking photos to send to his colleagues more creatures start showing up who don't want to be found out, and will do anything to stay hidden. This one was just too short for me. I think it had some pretty good potential, but just ended up being too odd for me. It was definitely creepy, though, and I would have been scared out of my wits if I was that paleontologist. I also wouldn't be that stupid, though. Let Sleeping Ghosts Lie is a comedy about a reporter going to a house that is supposedly haunted to get footage of the ghost, and interview the living resident, but what they find out is that the living maybe scarier than the dead. This one was alright. I didn't hate it, but I also didn't like it. I think I didn't like it, because it didn't fit with the collection. Yes, it was about a ghost, but everything in this book is creepy and this one was a comedy. I haven't really been a fan of comedic stories, anyways, so that might have something to do with it as well. Finally, Something Wiccan This Way Comes is about two children who are brothers. When they are out walking past an abandoned home they find that someone has finally bought it. The owner, who is a old woman, finds the boys sneaking around her property as they try and find out who bought the old house. She pays the boys to help her fix up the outside of the house, but the boys soon learn that this isn't an ordinary old woman. She is really a witch who has a very haunting past behind her that may just ruin these boys lives. Something Wiccan This Way Comes was by far the best one out of the three. It had a very creepy feel to it all, and everyone knows a scary story about kids is always going to give you the chills. I completely enjoyed this story and got the creeps the whole time while reading it. The ending is completely heartbreaking and you get a pretty good hint in the beginning as to what is going to happen in the end, but you still find yourself wishing it doesn't happen. This was a pretty enjoyable collection. I thought it was a nice creepy read that had something for everyone. My favorite part was probably the poems, which is very odd since I am not a poem person AT ALL. They really just gave the book a whole aura of creepiness, and I loved that they rhymed. It was a little hard to go from rhyming to story telling, but I made it through alive. The last short story in this collection was by far my favorite, and I think Dan did an excellent job. For this being his first YA targeted audience I think it was really good.